In the UK alone, 1.54 billion aerosols are filled each year. Filling is a high speed operation. The videos below show how aerosols are filled, have the valves fitted and propellant injected thought the valves. For products that are too viscous to be filled through the valve the product is filled before the valve assembly is added. This gassing line is using compressed inert gas ( an ideal gas) as a propellant. If it was using liquified propellants such as butane, it would not be allowed to operate in the main building. Look for the point where the cans leave the main building through a small opening. This is the exit to the external gassing house. Videos by R+R Midlands Ltd. 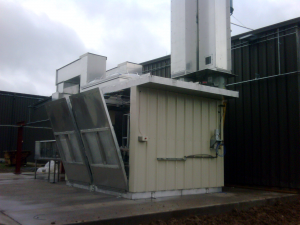 These small green buildings contain the gassing machines that fill aerosols with the propane/butane propellant. Below is a close up view of a similar filling house. The walls and roof are designed to come off in the event of a gas explosion. The gassing houses are outside the main building to protect people inside. Each one is ventilated with powerful extractor fans to take away even the tiniest amounts of propellant vapour. Gas sensors and fire detectors that sense the smallest flame automatically set off fire extinguishers and shut down the propellant supply. This technology makes gassing a safe operation. Leaks of propellant vapour from faulty cans can happen after filling. These can be detected in a water bath as bubbles (see page 6). 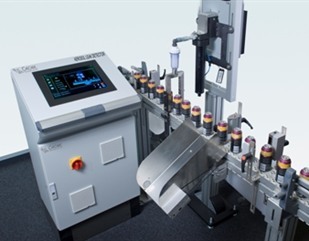 Some production lines use gas detection equipment that can detect a few parts per million of gas at high speed, without even stopping the conveyor belts. Butane absorbs certain wavelengths of infrared light, so by shining an infrared laser through the gas any absorption will be detected as a drop in the light level by an infrared detector. The laser takes 100,000 samples per second and is so fast that it can trigger an ejector to eject the leaking aerosol from the production line. 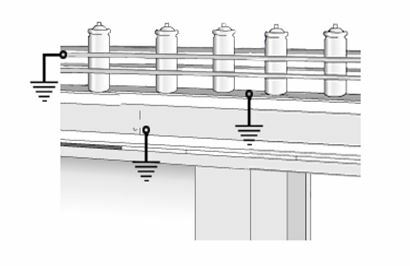 The image on the right shows the gas sampling arch. Gas is sucked into the holes in the arch at high speed. If the system detects a leak the aerosol is pushed off the production line.The whole process takes less than 1/8th of a second. Even with many safety systems there is still a chance that a spark could start a fire or cause an explosion. Wearing synthetic fibres like polyester together with cotton or wool can cause sparks. Workers in aerosol filling plants are not allowed to wear any synthetic fibres. Some companies pay a clothes allowance because cotton products are more expensive. When an electrical switch turns off a motor there can be a sudden high voltage induced in the motor coils.This can cause a spark. There are special 'explosion proof' switches than keep any sparks sealed inside the switch casing and also special motors that do the same. Rubbing plastics together is a good way to make electrostatic sparks. 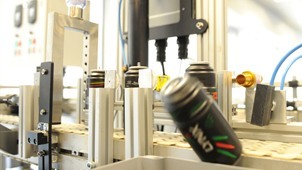 The conveyor belts in aerosol factories are made from plastic containing conductive carbon. Any electrical charge is conducted away to the metal parts of the machinery. Airport baggage carousels use the same conductive plastic for the conveyor belts. Sparks occur when two objects have a different electrical charge. To prevent sparks all machines are connected to earth.